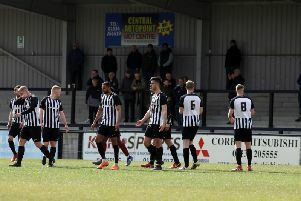 Corby Town boss Tommy Wright will haul his players in for an extra training session tonight (Wednesday) after their poor run of form took a turn for the worse. For the second season in a row, the Steelmen were dumped out of the FA Cup at the first hurdle by a team from a lower level as they were beaten 2-1 at Rushall Olympic last night after the two teams had drawn 1-1 at Steel Park on Saturday. The latest setback means Corby are now on a run of nine matches without a win and have lost five of their last six. A tough test at North Ferriby United in the Vanarama National League North now awaits them. And, although Wright felt his team’s display last night was a “massive improvement” from the weekend, he knows he must do all he can turn their fortunes around. “I thought it was a massive improvement from Saturday,” the Steelmen boss said. “We played like we have done before because we attacked them and we did it with pace. “But we got done by two crosses into the box and headers at the far post. “I always said that the team who wanted it the most would win and their lad wanted to win those two headers more than we did. “It was very frustrating and there were two big penalty decisions that went against us. “We are out of the cup and that is bitterly disappointing but we have to move on.